Chelsea extended their unbeaten start to the season with a 3-1 victory over Crystal Palace on Sunday evening. A brace from Alvaro Morata and a strike from Pedro proved to be the difference between the two sides, despite Chelsea not being at their fluid best. The first half an hour of the match passed by with very little to shout about for either side, but Chelsea managed to open the scoring at the first real opening of the game. Pedro acrobatically delivered a dangerous low cross into the Palace box before Morata turned on a dime to lash beyond the helpless Wayne Hennessey. Their lead could have been doubled just minutes later when Willian bundled the ball in, only for the goal to be dubiously ruled out for offside. That proved to be the final action of the first half, with Chelsea deservedly leading based on the pattern of play. Whilst the first half ended brilliantly for Chelsea, the second couldn't have started any worse. Palace leveled five minutes after the restart through Andros Townsend, who scored his first goal of the season with a well taken finish into the bottom corner after he was put through on goal by James McArthur. Chelsea found it difficult to break down a resolute Palace defence and were denied at the sixty minute mark by Hennessey, who produced a fine save to keep out a powerful header from David Luiz. That mattered not, as minutes later Morata doubled his and Chelsea's tally with a smart finish at the far post, following a dangerous free-kick from substitute Eden Hazard. The win then looked to be as good as confirmed with twenty minutes left on the clock when Pedro notched his fourth goal of the season with a lethal finish from inside the 18 yard box. Morata had the chance to round off his evening with a hat-trick right at the death, but his chipped effort was easily saved by Hennessey. ​Chelsea certainly weren't at their best for large portions of the game, but in the end their quality shone through - especially after the introduction of Hazard and Mateo Kovacic. The duo introduced some much needed dynamism to Chelsea's play, something that was sorely lacking previously. This highlighted just how important they are to the system the Italian manager is trying to impose at Stamford Bridge. The win moves Chelsea up to second in the league and the blues remain hot on the heels of leaders Manchester City, who could potentially drop points next weekend when they face off against Manchester United. Starting XI: Kepa (6); Azpilicueta (6), Rudiger (6), Luiz (6), Alonso (6); Kante (6), Jorginho (7), Barkley (5); Pedro (7), Wilian (5), Morata (7*). Substitutes: Kovacic (7), Hazard (7), Fabregas (N/A). 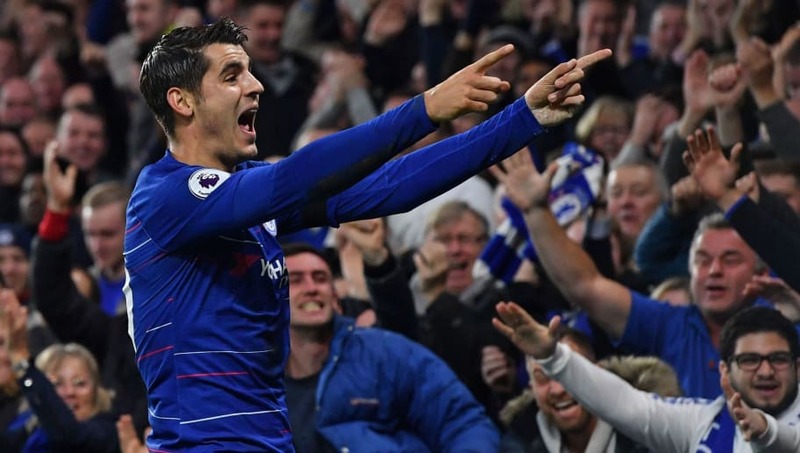 Star Man - He's received an awful lot of stick during his time with Chelsea, but Morata is starting to show some signs of life in recent weeks. He looked sharp all evening and he took both of his goals very confidently. With Olivier Giroud still out injured, Chelsea supporters will be hoping that Morata can kick on from here an continue to find the back of the net on a regular basis. Worst Player - ​Ross Barkley had been in stunning form in the run up to this one, but he simply wasn't at the races in the centre of the park. He gave the ball away cheaply on a number of occasions, slowed down potential counter attacks and was often swamped by the Palace midfield. Barkley due a bad game. He has the right attitude, he will learn from it, keep working and improve. Still overall doing great. Roy Hodgson looked to have set his ​Crystal Palace side up perfectly to counter Chelsea's possession-based football during the opening exchanges, but the drawbacks to his narrow team selection were plain to see, especially during the closing stages of the match. It was by no means a poor performance from the Eagles, but their lack of personnel at the top end of the pitch came back to haunt them. If it hasn't been hammered home enough so far this season, it is absolutely imperative that Palace invest in a new number nine in the January transfer window. ​Wilfried Zaha and Townsend did a reasonable job up top, but they are much better suited to wide roles. Starting XI: Hennessey (6), Wan-Bissaka (7), Tomkins (6), Sakho (6), Van Aanholt (6); Meyer (5), Kouyate (6), Milivojevic (5), Mcarthur (6); Townsend (6), Zaha (6). Substitutes: Ayew (5), Schlupp (N/A). Star Man - Willian barely had a sniff of the ball out wide for Chelsea during his time and much of that was down to the performance of youngster Aaron Wan-Bissaka. The right-back has been garnering high praise for his performances ever since he broke into the Palace starting XI at the end of last season, but this was one of his most accomplished showings yet. I must say that Wan Bissaka is a quality player in the making. Worst Player - Palace fans would have been very excited to see Max Meyer's name on the team sheet for this afternoon, but he ended being incredibly ineffective out wide. Admittedly, his ineffectiveness was down to the fact that the system clearly didn't suit him, so there will surely be better games to come for the German. Max Meyer very very very disappointing. Max Meyer probably the worst number 7 I’ve ever seen in the prem. Chelsea will be looking to confirm their place in the knockout stage of the Europa League when they face off against BATE Borisov on Thursday evening. As for Palace, they have another London derby on their hands when they welcome Tottenham to Selhurst Park on Saturday afternoon.